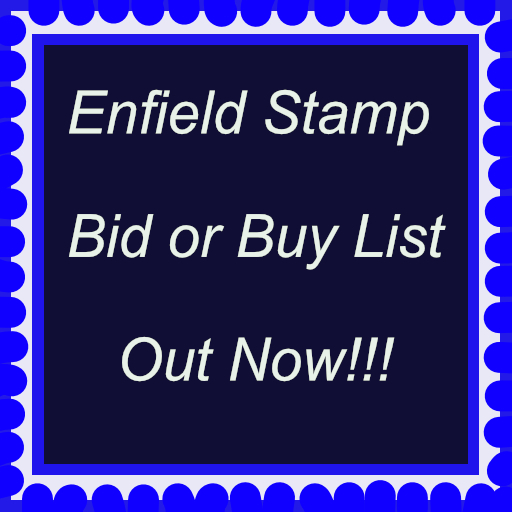 Enfield Stamp Bid or Buy List 463 - Enfield Stamp Company Ltd.
We have been able to get on well, this week, working on Eric’s collection. David is back from his travels and has spent quite a lot of time describing some of our other purchases featuring British Commonwealth whilst I have had the pleasure of digging into the mass of unsorted Ceylon which filled two 35 litre crates. In the Ceylon section, featured overleaf, you will find extensive accumulations of 1885 Cents Surcharged issues, lotted by value, suitable for further research into positional overprint varieties, Revenues, Stamp Duty, and rarely offered Telegraphs, along with interesting G.B. Q.V. covers into Ceylon. The modern side is not forgotten with new Sri Lankan collections too. Furthermore, our Postal Auction, sale 1004, April 6th., has a Ceylon section featuring 200 lots of singles, sets, blocks and varieties. And yet we still haven’t finished! Our intention is to start work shortly on our Spring Half Price Bargain Newsletter. As a selling incentive I have decided to make this Newsletter Post Free so purchases from this Newsletter will have no additional postage charge. Ceylon.Iran,Newfoundland,G.B.,Canada,Cyprus 1960 Republic to 50m. by country from Andorra to Sweden,many smaller countries inc.
19 1963 Freedom From Hunger M.on St.page,incomplete,some better inc.
20 1966 WHO HQ issues UM.in sets on St.pages,almost complete,fine. 22 1965 ICY BC.issues in UM.sets on St.pages,almost complete,fine. 27 Flora & Fauna:Series of UM.MS.depicting mainly animals,inc. process,cover stampless with `damaged by sea water’ cachet,good. Programme(ERP. )(SG.B71 C.£140),Trieste 1949 ERP.set(SG.94-6 C.
32 DISNEY:MICKEY MOUSEl1979-1995 FDC.coll.in five Benhams FDC. U.to 5r.,Seiyun 1954 set M.(SG.C.£26)& Hadhramaut 1955 set M.(SG. 38 P.Dues:1935 1c.,1943-6 10c.to 2Fr.,4Fr.to 20Fr.,M.,good to fine. sets,inc:1961 Defins.,1963-65 Comms.with Red Cross,later Comm. 43 All periods to 1960’s mostly M.coll.on Hagners inc.1938-51 M.
64 page S/bk.,inc:1954 Bruges 7Fr.& 9Fr.U.on FDC.& low vals. 69 1953-80 M.& U.coll.with some dup.on St.pages with vals.to 10s.U. C.£22),1935 S.J.1s.M.,etc.,Pictorial range to 1/6d.,fair to good. 14L.,many later Comm.sets,Officials,etc.,good to fine. (209) STC. 80 1924-35 M.& U.coll.on leaves inc:1931 Airs,1932 Air 18L.,24L. 82 P.Dues:1884-1947 mainly U.,some M.coll.on leaves,with some dup. 90 1900-50 M.& U.coll.on album pages inc:1900 Q.V.set M.,G.VI vals. to 1s.,5s. (trifle stuck to page)etc.,fair to good. (53) Total Cat. endorsed “for use of servives only” Unused.,central crease,good. 99 1857-G.V U.range on old S/bk.inc.Imperf.1d.(2),2d.,Perf.1d.,10d. 104 1912-35 G.V coll.mostly U.with dup.on St.pages with 1912-25 U. 107 Q.V.-G.V M.low val.range on St.card,inc.Q.V.to 25c. (2),1903 var. sheet noted,& a page of description detailing how to plate,good. 112 1935-90 M.accum.on St.pages,much UM.,some Plate blocks,etc.,vals. 114 1885 5c.on 16c. pale violet,Wmk.CA.,thirteen U.example on St.
116 G.V issues:M.& U.accum.of War Tax Ovpts.& Surch.issues,on St.
119 1921-22 5c. purple,Wmk.script,SG.341 four blocks of four from Pl. 2r.50,103-05 var.vals.to 75c.,1904-05 25c. (3),1910-11 2c.,10c. 138 1885 20c.on 24c.green(20),20c.on 32c.slate(5),U.examples on St.
detailing the twelve diff.types of Surch.,good to fine. (16) STC. 146 1885 5c.on 96c.drab,seventeen U.examples on St.page,fair to good. 155 Revenues:1862 1s.,2s. (2),Foreign Bills,other Q.V.issues,Edw.var. 156 All periods to about 1970’s mostly U. (some G.V & G.VI M.)accum. 161 Q.V.M.& U.bits & pieces accum.on St.leaves inc.1885 5c.on 64c.(M. 166 1885 5c.on 24c.green:Twenty U.examples on St.page,fair to good. 167 Q.V.to C.1970 UM.,M.,Unused & U.coll/range in large S/bk.inc. 169 1885 brown E.to Rangoon bearing 5c.on 32c.slate,4c.mauve & 16c. pale violet,Pmk’d Colombo,Calcutta & Rangoon,endorsed per P.& O. 171 1860 E.to Colombo from POOLE,DORSET bearing G.B.1858 6d.horiz. in sunken card & Imperf.IMPRIMATUR,good to fine. (3) SG.131 (C.
176 Fiscals & Revenues:Extensive U.dup.accum.in bulging S/bk.inc. 179 INDIAN TELEGRAPH SPAMPS:USED IN CEYLON:1869-80 extensive U.coll. 180 1857 1d. :Remaindered specialized coll.showing diff.ptgs.,comp. 190 1875-2005 U.coll.on printed album pages inc.1926 Surch.pair U. 193 1874-1923 M.& U.coll.on St.page inc.1874 1d.lilac Unused(SG.1 C.
194 1877-1970’s M.& U.accum.on St.pages in no order,minor dup.,inc. etc.,many shades indicated,not listed in SG.,etc.,fair to good. 202 1944-69 M.& U.coll.on album pages inc:1944 set M.,Deps.sets M. 1s.U. (SG.112 C.£80),1891 2 1/2d.on 2d.U. (SG.70 C.£50),G.VI U.
Cols.,some smaller,inc:Equatorial Africa 1953-55 Air 50f.-200f. 2)(SG.1 C.£60 ea. ),French PO.in China 1907 Surch.set M.less 10c. 3Fr.in bl.4,all UM.,usual gum toning & minor faults,fair to good. 219 1922-27 90c.on 75c. (3),10Fr.on 5Fr. (5)& 20Fr. (7)all in UM.marg. 222 Upper Senegal & Niger:1906-15 small M.& U.range on leaves,good. 5Fr.,1938-40 var.vals.to 2Fr.50,Airs etc.,good to fine. (104) STC. Q.V.vals.to 1s.,1935 S.J.set,G.VI vals.to 10s.,1953-59 set(SG.c. 243 1947-49 M.,few U.,coll.on leaves inc:1948 set,1949 set(U.,C. 244 1947-49 UM.,M.& a few U.,coll.on leaves inc:1948-49 set to 90Pf. 249 1945 Numeral set to 60Pf.,Perf.,in UM.sheet of 100,good to fine. 251 STORKAU:1946 MS.on greenish,U.on small piece with Comm.Pmk.,fine. 253 All periods to 1960 M.& U.coll.on album pages inc:1960-62 10s. 261 Small three marg.Maltese Cross Pmk’d range suitable for plating. X,ideal for study,reconstruction,etc. (128) Cat.from £60 ea.,SG. X,ideal for study,reconstruction,etc. (94) Cat.from £70 ea.,SG. X,ideal for study,reconstruction,etc. (131) Cat.from £60 ea.,SG. X,ideal for study,reconstruction,etc. (141) Cat.from £60 ea.,SG. X,ideal for study,reconstruction,etc. (128) Cat.£60 ea.,SG.Spec. X,ideal for study,reconstruction,etc. (104) Cat.from £80 each, SG. 277 4d.deeply blued,small Garter,U.,two blunt Perfs.,fair. (1) STC. 285 6d.Wmk.spray,Pl.6(2 shades),8,9,U.,on page,fair to good. (4) STC. 302 1/2d. (two shades,1d.,1 1/2d.,2d. (two shades),5d.,U.,on page,good. 312 All periods to 1990’s UM.on Hagner & cards,better booklets inc.
1991 stamps(SG.SB.42 C.£12),stamp mostly in sets,vals.to £2,fine. 317 1953-1980’s M.& U.coll.with minor dup.on St.pages with many Comm. sets,inc.1966 Defin.set UM. (SG.231-45 C.£21),etc.,good to fine. G.VI to 5s.,needs checking for Perfs.,fair to good. (17) Min.Cat. 321 1863-1936 M.& U.coll.with dup.on St.pages inc.1863-71 1d.& 6d.U. 325 1992 Defin.range UM.on Hagner,inc.top vals.$5,$10,$20 & $50,fine. 329 1937-52 G.VI U.coll.on Hagner inc:1938-52 Defin.to $10(both inc.
SG.161 C.£140),1937 Coro.set & 1946 Victory sets,fair to good. 331 All periods to 1954 M.& U.coll.on album pages with G.VI M.vals. in blocks,inc.1953 Everest set M..(2)(SG.C.£14 ea. ),1954 Cent. period 1981 to 1988 looks like mainly UM.,then rest is UM.& M.
337 1948-80 UM. (few M.or U. )coll.on Schaubek leaves inc:1948-49 var. vals.to 2 1/2g.,1949-50 to 5r.& 25r.with 10r.U.,1950 Ris Ovpts. 344 Express:1925-66 M.& U.coll.on leaves inc:1925 2L.(U. ),1903 25c. inc:1943 Allied Mil.Govt.set in UM.bl.4,(C.£38),1912 St.Mark 5c. 348 1921 Wmk.Crown,Perf.14 1/4 x 13 3/4,M.range on leaves comp.1c. 359 1924-40 No Wmk.,Perf.14,M.range on leaves comp.1c.(3),2c.(3),5c. 362 1901-09 M.(1 U. )coll.on neat pages inc:1901 1Pi.on 25c.M.& U.(SG. shades)& Perf.11 40c. (C.£46),1928 7 1/2(2),1L.25,1L.75(M.C.£194. MILLENARY sets M.,1932 Airs(M.& U.sets),1932 May Air 50c.,60c. 368 1912-22 M.range on leaves comp.1c.(4),2c.(6),5c.(3),10c.(4),15c. 370 1903-1927 M.& U.range on leaves inc:1903 10c.(U. ),1906-16 to 1L. Defence sets,1926 Defins.var.vals.to 1L. (2)M.,etc.,good to fine. 372 1953-1990’s M.& U.coll.with dup.on St.pages inc.1956-8 Defin. to 3d.,1883-97 M.& U.range to 2s.,1905-11 M.& U.range inc.2s. 377 All periods to about 1980’s M.& U.coll.on St.pages,fair to good. 378 1964-68 UM.range comp.SG.528-9,530,532,680,722,735,fine. (7) STC. sources,some dup.,inc:1954 Defin.set M.(x 2)(SG.C.£60),Q.V.vals. 384 1904-34 M.range of `tigers’ on St.pages inc.1904-22 range to 50c. 385 & some States:1950’s to 2010 U.accum.in no order on stuffed St.
issues(No 1952)M.set(btwn.SG.3 & 22 C.£118),same for Malacca(SG. 1982 Darwin set in UM.blocks of four(SG.C.£12),1968 1r.Dodo UM. 391 Mainly M.,some U.,all periods range on St.leaves inc:1946 100Fr. 392 1891-94 25c. pale grey-green(SG.16a C.£425),40c.black & rose(SG. 399 & Antilles:1950-1981 predom UM.,few M.(some earlier issues),coll. 403 All periods to 1970’s M.& U.accum.from 2 collections,from perf. Q.V. Heads(needs sorting)with vals.to 1s.,1920 Victory set(SG.C. 406 All periods to 1931 M.& U.coll.with minor dup.on St.pages inc.
Olympic set M.in blocks of 4,1953 Tourist set U.,1958-62 Defin. 421 1941 issues M.on pages btwn.SG.300 & 319b inc:50o.maroon Wmk. 424 1909-31 M.coll.Comm.& Defin.on pages & card inc:1909-29 Defins. 2/6d. (2),2s.& 10s.M. (SG.C.£99),1963 Revenue set M.,1964 Defin. 438 1958-89 M.& U.coll.on Hagners,many sets,inc.1964 Space Exp.MS.UM. 443 1870-84 5r. (2),15r.,20r.,50r.,1892-94 75r.,Unused reprints,good. order on St.pages inc.1864-76 range to 4d.U.,1882-4 4d.Surch.U. (SG.27 C.£21),1891-2 1/2d.on 3d.Die II M.(SG.56 C.£80),1912-21 M.
461 1937-51 M.& U.range with minor dup.on St.page,vals.to 2/6d.,good. 463 All periods to 1932 M.& U.coll.with dup.on St.pages inc.1862 6d. U. (SG.C.£19),1863-68 6d.U. (SG.7 C.£75),1869 1s.indigo U. (SG.13 C.
467 1954-70 M.& UM.mainly sets coll.on leaves inc:1954 Sports set(M.
469 1949-50 Views Defin.set to 200L.,UM.,on page,very fine. (16) STC. corner)& 4d.bl.of eight(2×4),both UM.but heavily toned gum,fair. 478 1937-60 M.coll.on album pages inc:G.VI vals.to 10s.,etc.,good. 480 1956-66 M.coll.Comm.& Defin.on neat album pages,complete btwn. 481 Provinces pre 1910:All periods M.& U.accum.in no order on St.
pages inc.Transvaal vals.to £1(SG.272a C.£22),Natal vals.to 2s. 493 1947-1950’s U.coll.on Hagner inc.1949 Biennial Exh.50L. (SG.89 C.
£10.50),1947 Radio Anniv.20L.& 50L. (SG.C.£21),etc.,fair to good. 1951 Verdi set,1947-8 Defin.range inc.100L. (SG.17 C.£70),50L.(SG. Chi-Minh superimposed on flag,Unused & unissued.Unknown status.